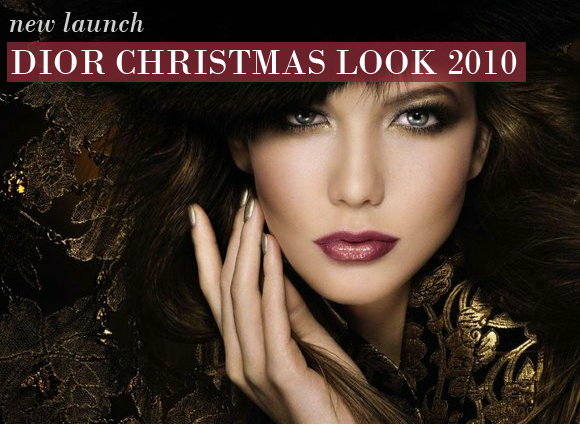 If ever there was a time for all-out, glamorous make-up, it’s the Christmas party season. And as the go-to brand for show-stopping make-up, Dior pulls no punches when the most wonderful time of the year rolls around. By now we’ve almost come to expect the show-stopping pigments, the luxe formulations, and the impeccable finishes. So we were waiting with baited breath to see what Dior was offering for its Christmas Look 2010… and our high expectations were more than met! The Christmas Look is dripping with molten gold, inspired by Christian Dior’s love of the luxurious, glittering and ubiquitously elegant metal. 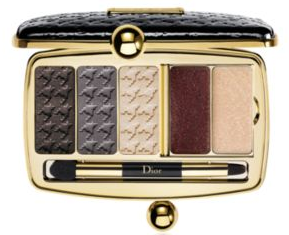 Gold comes in all shades and finishes in this collection, from the champagne shimmer of the Dior Vernis Nail Colour in Timeless Gold, to the gilded metallic shades of the 5 Couleurs Eye Compact in Five Golds. Here are our most anticipated picks of the new collection…. The undisputed star product of the new collection is this limited edition Minaudiere palette, a painfully chic miniature clutch that is as much a fashion accessory as it is a make-up product. Adorned in a black houndstooth pattern and finished with sleek golden touches, the glamorous compact houses smoky hues for the eyes and sumptuous colours for the lips. A limited edition set of shimmering golden shades with which to create fascinating eyes. 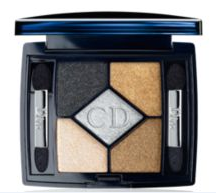 The complementary shades can be worn alone or blended together for a sophisticated look with a twist of glamour. The compact palette and its two dual-ended applicators make the set perfect for on the go; it’s a gorgeous and functional addition to your seasonal make-up bag. Super glossy colour for high impact lips. These new shades are the epitome of glamour pushed to the extreme, with crystalline shine, full volume, and show stopping colour. Any one of these bitten pinks or vampish purples is the perfect compliment to the array of molten golds for the eyes and face. If you can only have one shade, consider the audacious and completely on trend Black Lamé, an inky shade shot through with golden flecks. A reworked masterpiece; the iconic Dior radiance booster is revamped with a limited edition golden twist just for Christmas. Just the right amount of light reflecting golden particles smooth away imperfections and illuminate the face beautifully, without being overly glittery. Use as a shimmering primer, a contour highlighter, a dark circle minimiser or an eye shadow base, and achieve an unrivalled radiance. 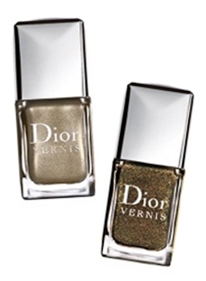 New season shades of the hardwearing and gorgeously shiny Dior Vernis Nail Colour? That’s pretty much our nail heaven. The hypnotising gold hues of the rest of the collection are carried through into two very different interpretations of the metal: the refined and smooth white gold pearlescence of Timeless Gold, and the chunkier flecks of burnished antique gold in Czarina Gold. Complimentary shade Rouge Garçonne injects some colour into the proceedings; a gorgeous raspberry hue that is perfect for Christmas. I love this pen. I have been using it for a couple of years now and it really is worth spending the extra money on as it lasts. I use this as a highlighter and I don't need to top it up during the day at work at all. I would highly recommend this to anyone, and especially anyone who suffers from dark circles. This entry was posted on Thursday, November 4th, 2010 at 8:22 am and is filed under Make-up, New products. You can follow any responses to this entry through the RSS 2.0 feed. You can skip to the end and leave a response. Pinging is currently not allowed.